It’s extremely hard for me to understand why any society would tolerate or condone systematic animal cruelty, but unfortunately, there are still many cultures throughout the globe that do. That’s because many of them still view animals, including dogs and cats, as objects rather than sentient creatures deserving of compassion, protection and respect. South Korea remains such a country. And while it’s not a good place to be born a dog, it’s an even worse place to be born a cat. First off, South Korea has a huge homeless cat problem. Feral and abandoned felines are extremely common, especially in and around large cities such as Seoul, which is estimated to have approximately 200,000 feral cats living within its borders. With no system in place to humanely reduce their populations and few animal welfare organizations or shelters able to help and protect them, stray cats are basically on their own to either survive or die, whether from starvation, extreme temperatures, disease or abuse at that hands of humans. Maybe that’s why most street cats rarely live beyond five years of age. They are simply seen as vermin – vermin to be destroyed. 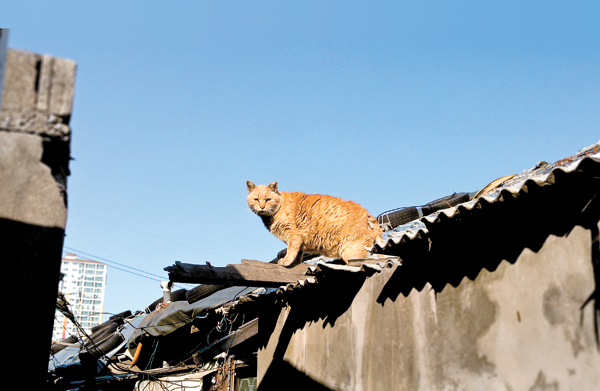 In Seoul, dirty, starving and sickly felines are common sights in alleys, on rooftops and in parks. They live on the streets, scratching through trash bins in search of food, catching rodents that roam around the many restaurants and seeking shelter under parked cars or behind buildings. They are shunned, have objects thrown at them and are always at risk of being abused, often in very cruel and sadistic ways. As a result, most stray cats are terrified of humans. To make matters worse, South Korea is home to a thriving, albeit illegal, dog and cat meat trade, a gruesome industry that consumes approximately 2.5 million dogs and 100,000 cats each year. Unlike in China and Vietnam, where cat meat is considered a delicacy, South Koreans tend to prefer dog over cat meat and primarily consume cat in the form of soups, stews or “health tonics” called goyangi soju (liquid cat). Falsely believed to have medicinal properties that can cure arthritis, rheumatism and other ailments, this thick, disgusting broth is created by bludgeoning and then boiling cats alive in large pressure cookers, often while they’re still conscious. What a sad, grisly end to an already miserable life. Unlike dogs used in the South Korean meat trade, cats are not farmed for their meat but are stolen, surrendered or most commonly, picked up as strays. And with such an abundance of homeless and starving cats within easy access, it’s fairly simple for butchers, meat traders or individuals to trap these vulnerable animals with food-baited traps. Clearly, the public’s negative perception of cats only enables the cruel practice of cat slaughter to continue. 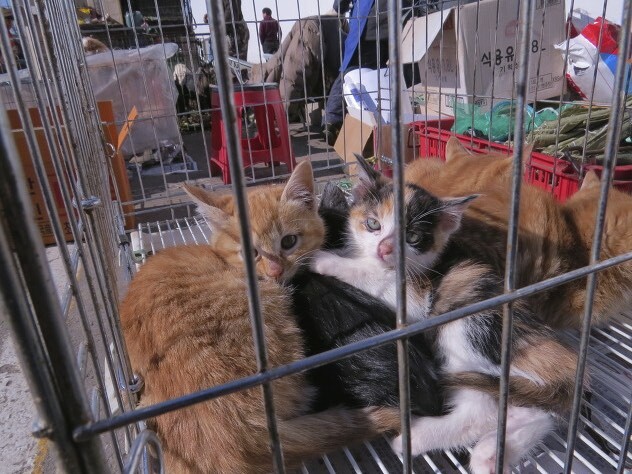 However, protests by animal rights groups have led some districts in Seoul to realize that killing or relocating cats are not practical, humane or sustainable solutions to their stray population problems. So increasingly, trap-neuter-return programs (TNR) have become the new method of choice, with 25 districts carrying out stray cat neutering programs with city government support. But not surprisingly, due to poor regulation and oversight, the programs have been riddled with problems. While cats definitely have a bad rap in South Korea, there are small signs that attitudes are warming toward them. While it is believed that only one in 5,000 Koreans own a pet cat, felines are starting to gain favor as domestic companions, especially among the country’s younger generations. One recent trend seen popping up across South Korea, especially in Seoul, Daegu and Busan, may signify that things are indeed changing for the better for felines. 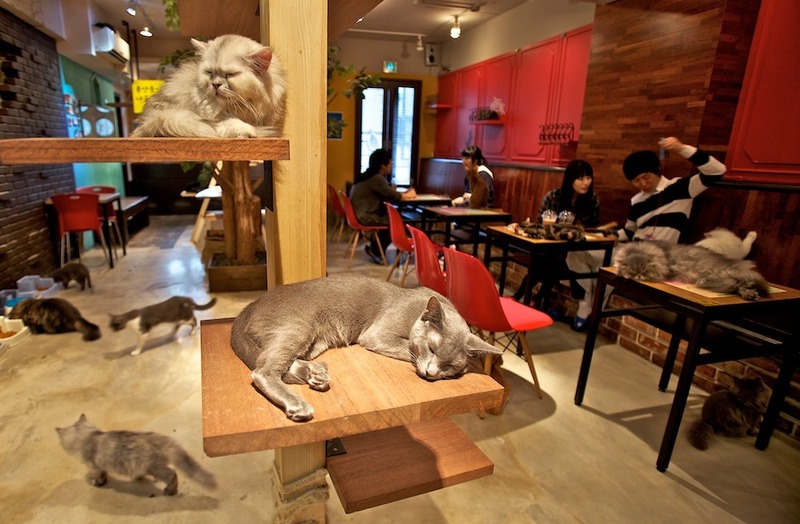 Enter the Cat Café, a popular Korean pastime originally developed in Japan and Taiwan. Like Japan, Korea’s cities are densely populated, with the majority of people living in small, close-knit apartments that have strict “no pets” policies. Hence, cat cafés are able to fill a need by providing safe, clean and relaxing social environments where animal lovers can interact with friendly (often purebred) felines and enjoy caffeinated beverages. 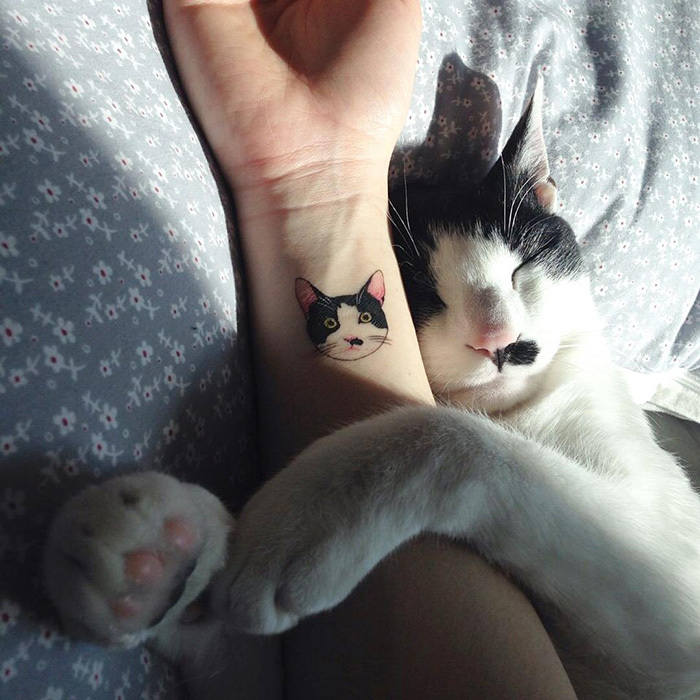 What a great way to change the hearts and minds of former cat-haters! What could possibly go wrong? Michele Brown, co-founder and director of SayNoToDogMeat.Net, a non-profit organization focused on ending the dog and cat meat trade in Asia and Africa, asserted that while businesses such as cat cafés may have favorable influence on changing the perception of cats in South Korea, the country has a very long way to go in becoming a more humane nation. Hopefully, as more worldly, conscious and caring generations of South Koreans begin to replace the ignorant, callous and cruel, we will see a much-needed sea change in how the country views, treats and protects its animals, especially those dependent on humans for their care and survival. As one of the most technologically advanced, mature democracies in the world with an impressive record of innovation, economic reform and sound leadership, South Korea has much to be proud of. But when it comes to animal welfare practices and policies (or lack thereof), it should be deeply ashamed. I look forward to seeing this mighty powerhouse of a country mature into a more compassionate, animal-friendly society where tougher laws will actually be enforced; where well-run shelters will be designed to help, not harm, abused and abandoned animals; where the greedy pet industry will be regulated and controlled; where prejudice and superstition against certain animals will be eradicated, and where “cuteness” will cease to be the superficial standard by which an animal’s life is valued. Meanwhile, I will not be spending my tourist dollars in South Korea or in any country that condones and supports systemic animal cruelty, whether in the name of “cultural tradition” or otherwise. There is no excuse for barbarity and no country has the right to call itself “civilized” while carrying out such depraved behavior. South Korea has a lot to lose from its poor reputation in the global animal welfare community. And the eyes of the world are watching. 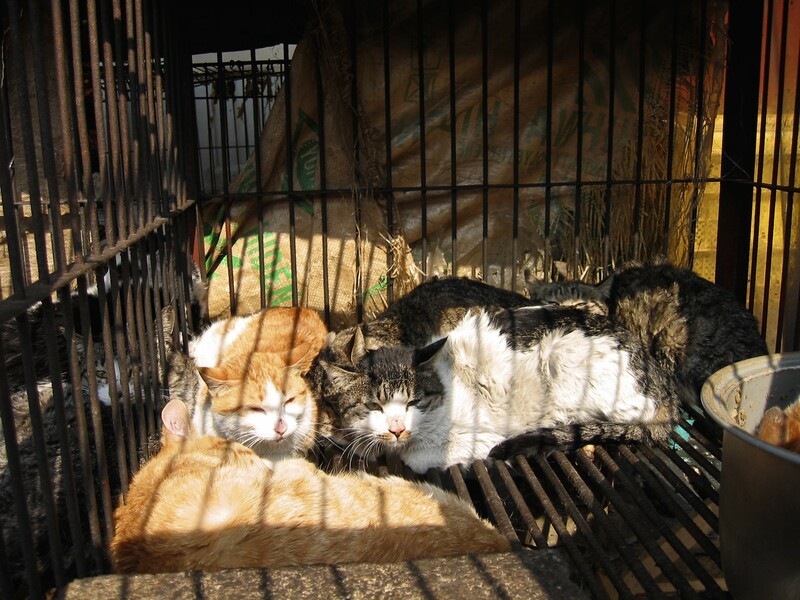 This entry was tagged animal cruelty, animal welfare, dog and cat meat trade, street cats. Bookmark the permalink.